The past few years have seen the debut of Perez Art Museum Miami (PAMM) on the bay. Now, two new additions are ready and waiting to show their new colors inside and out in this upcoming season of art shows in Miami. Miami is bursting with new museums, all looking to carve a cultural identity out of the tropical landscape. The success of the Art Basel Miami Fair and the world class events that surround it have propelled a surge of major museum projects. The past few years have seen the debut of Perez Art Museum Miami (PAMM) on the bay, a major remodeling of the Bass which opened October 29th, the stupendous arrival of Faena Art and accompanying luxe hotel, and the recent announcement of the Rubell Family Collection’s move to the gentrifying neighborhood of Allapattah. There’s also the arrival of Institute of Contemporary Arts (ICA) ready to open in its huge new digs in December. The first new museum out of the season gate is The Bass which opened to the public in late October after a 2 year renovation. Breaking ground in 2015, The Bass embarked on a $12 million project to transform the limited space. They have a primo location on Collins Avenue with a straight shot view of the ocean and a large park that serves as a cutting edge sculpture garden during Art Fair week. From an expanded and more dynamic physical space The Bass also has a new visual identity including name, logo and website. Eternity Now, 2015 by Sylvie Fleur, a neon sign, graces the top of the entryway. At a press preview, I found the space to be totally transformed. I had been going to The Bass since 1986 when it was a smallish limestone building filled with creaky paintings and art from the masters like Botticelli and lots of religious gold leafed statues. Now they have totally blown out the building behind the façade, pushing back and up to expand to over 12,800 square feet of exhibition space with four large galleries, a café, a small bookstore and a new enclosed courtyard for special events. The lobby has a sleek, clean look, with a welcoming installation right up front. It’s literally a welcoming installation as it is composed of dozens of LED signs that say Welcome in as many languages, the art is by Pasquale Marthine Tayou and is called Welcome Wall. The back gallery has an unusual twist as the artist, Tayou, has curated ancient objects from the permanent collection – the aforementioned creaky gold leafed religious items – and transformed them with some of his own clever work and hundreds of brightly colored alabaster eggs festooned to the walls. The effect is enthralling, visually connecting the dots between ages and cultures – an Egyptian sarcophagus lies beneath a Botticelli painting, while Tayou’s glass head sculptures with found objects wrapped around them dot the room. Upstairs is given over to the art man of the moment Ugo Rondinone, whose enormous Miami Mountain sculpture of stacked colored boulders has been holding its own in the sculpture park near Collins Avenue since last year. 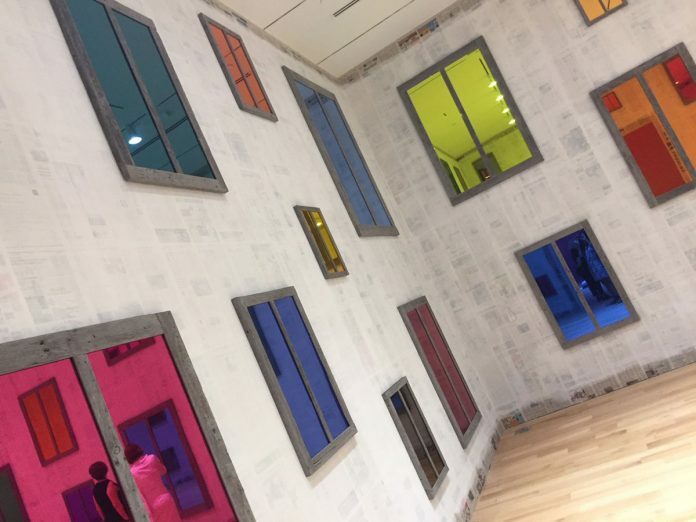 He has three installations here – a room of mirrored windows on white washed tearsheets from the Miami Herald called “clockwork for oracies II”; a huge gallery filled with sad reclining lifesize clowns called “good evening beautiful blue”; and my favorite, an enchanting neon blue gallery with 6 large looping videos playing to a haunting soundtrack. A narrative forms in your head depending on which video you start watching first. All the work truly works in Miami – with its bright colors, local tie-ins, slightly edgy vibe. Other galleries feature work from the permanent collection including a piece called Dial A Poem by poet John Giorno who also happens to be Rondinones partner. It’s an old fashioned black phone that you pick up and dial and hear a poem through the receiver. Overall the new space has a good feel, open and airy and everything smells of fresh paint. The new enclosed courtyard will undoubtedly be the site of many glam parties, and the lobby café a certain favored hangout. Over in the Design District a new museum with a controversial past arises. The Institute of Contemporary Art came tumbling out of the wreckage of MOCA (Museum of Contemporary Art) in North Miami when it imploded in 2014. The frustrated curator, Bonnie Clearwater, now at the Ft. Lauderdale Museum of Art, resigned when the city declined to support a major expansion. That led to a dispute between board members and the City of North Miami, when the institution split in two. In response, frustrated board members took the majority share of the permanent collection and left. The result was a new museum they created called the ICA, under the guidance of deputy director and chief curator Alex Gartenfeld. The museum has been holing up in the oddball space connected to The Moore Building which was an old furniture showroom built in 1921. It has four open floors and is attached to another more contemporary space they use next door that faces NE 2nd Avenue. A new museum has been in the works for years and now staffers are ready to move the permanent collection and operations from their temporary home in the Moore Building to the new space at 61 NE 41st Street Designed by Aranguren + Gallegos Arquitectos, the Design District space will measure 37,500 square feet, including a 15,000-square-foot sculpture garden. A gift from Irma and Norman Braman allowed the museum to secure the land rights for the sculpture garden. The museum will have three floors, two of which will be devoted to temporary special exhibitions. Unlike most other Miami museums, general admission will be free. So how do all these new museums see their place in the sun? 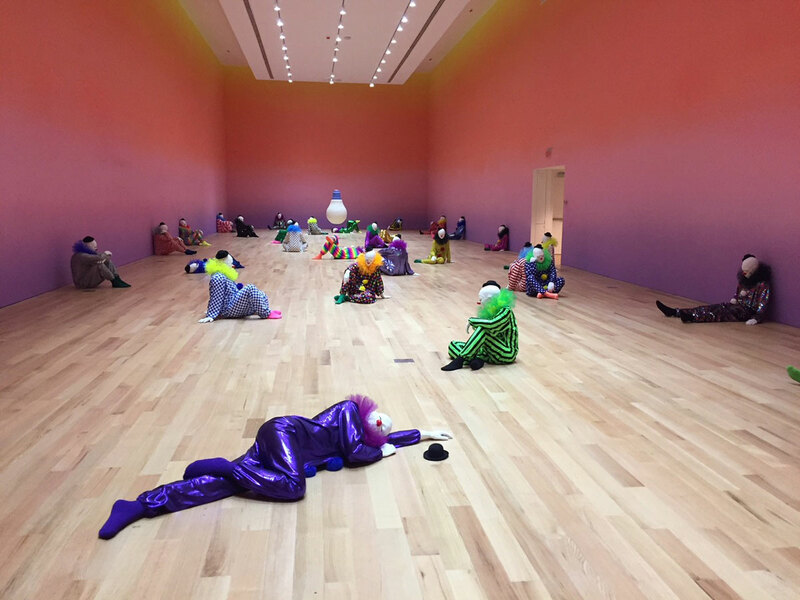 The ICA has a different focus from Pérez Art Museum Miami (PAMM), which has been exhibiting contemporary art from Chinese, Haitian, Latin American and American artists. The Bass plans on curating edgy contemporary art from all over. The ICA specializes in mid- and late-career European artists who have yet to garner massive success in the States. When Art Basel Miami and Art Fair Week rolls around in December, the new museums will be ready and waiting to show their new colors inside and out. The Bass which opened to the public in late October after a 2 year renovation. With another new museum at Design District Miami Museums Explode into Season.